circle DN.i.134 (paṭhavi˚, cp. puthavi˚ Snp.990); Vism.143 (˚ṃ karoti to draw a circle, in simile), Vism.174 (tipu˚ & rajata˚ lead- & silver circle, in kasiṇa practice); Vv-a.147 (of a fan = tālapattehi kata˚-vījanī). the disk of the sun or moon; suriya˚; Vv-a.224, Vv-a.271 (divasa-kara˚); canda˚ Vism.174; Pv-a.65. The turtle is in an ocean! They swim and do not float in space unless, there is a species of space-turtles? There is a full cosmological description in the Srimad Bhagavatam. The turtles name is ‘Akupara’ - in Sanskrit (see below). If we live in a holographic universe would that mean the Earth is flat? Its ‘information’ may be spread out on a 2D surface? I just remembered how the Greek gods live on top of Mt Olympus and how Brahmaloka is at the top of Mt Meru. This would suggest these myths may have an Aryan - pre-Vedic - origin. This would suggest these myths may have an Aryan - pre-Vedic - origin. or that they both discovered independently a common reality. We’ll never know. We do know these two cultures have the same root because of the same language family they share. We also find common symbols associated with the Gods - Vedic and Greek. If the language, the gods and, the cosmology have enough in common it is likely that this has come about as a result of Aryan tribal migrations seeding developments in both these civilisations. If the cosmology was radically different e.g. having a rainbow-serpent creator, marsupials and emus involved, it would suggest a different cultural origin? If there are gods living on top of a cosmic mountain then this must have been ‘seen’ by Aryan spiritual visionaries and past on to their descendents North and South. There were modifications over time - some syncretism - but the correlations are easy to see. Shiva and possibly, earlier Buddha’s, may have been Dravidians - real teachers from what we call the Dravidian culture - pre-Aryan? The ‘wanderers’ and ascetics may not have Vedic origins? The Brahmins seemed more interested in sacred fire ceremonies, devas and, cows. The ‘Bhagavata Purana’ has detailed cosmological accounts of this nature. I have got the ocean of milk story wrong! Its Maha-Vishnu who lies down on his multi-hooded naga bed that is floating on an ocean of milk and dreams the universes into existence. With every exhalation the universes appear like bubbles from the body of this beautiful cosmic giant and with every inhalation all the universes are absorbed back into his body (a multiverse theory). As this Puranic-cosmography seems to have appeared after the Buddha the ideas they contain may not have been around during his lifetime. 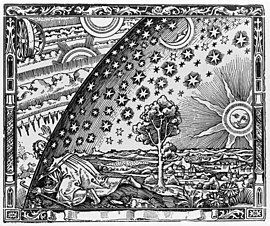 The following Wiki-link also includes Buddhist cosmology. 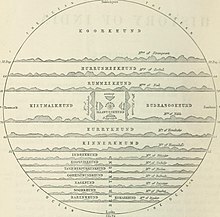 But although Ptolemy made his calculations with the assumption that the Earth is spherical, I’m not sure Indian astronomers really understood that… they removed a few things from his calculations in their derived works, notably the Axial precession, leading to shifts in the calendar between the West and India. Yes…, you’re correct, I agree with you, but the selection of parable that using the shape of the unusual stone mountain, which happens to be a spherical symmetrical objects might well be compatible with the facts that the shape of the earth is similar to it and also the age of the planet is also as long as it is depicted, right ?.. I don’t see why the mountain would have to be a sphere? The Buddha could have been referring to the mountains height and base dimensions - like a cone? I have never seen a mountain shaped like a soccer ball. That would be a huge symmetrical boulder - it may roll around and squash things. Mountains don’t do this - do they? "The leaves in the hand of the Blessed One are few in number, lord. Those overhead in the forest are far more numerous. " This stuff about sailing off the edge is a myth. The earth was known to be round at around the time of the Buddha and Erosthenes calculated it quite accurately about 200 BC. These points were made earlier in the thread.